This is the help section/online manual for The Handicapper. You can also find here the most frequently asked questions (FAQ) and answers. If you can't find an answer to your question(s) please don't hesitate to contact the me: hk@eastsidesportsanalysis.com or fill out the form below. Eastside Sports Analysis is a company providing betting tools and picks. The company was founded in 2013 and is based in Helsinki, Finland. The Handicapper is a desktop application to help you make better betting decisions. The current version is the 6th major release of the software. The first one was released in 2015. The software is free to download and try. To gain access to data updates you will have to subscribe to one of the offered packages (November 2018 onwards). The software only works on Windows operating systems. How much does the access to data updates for The Handicapper cost? There are two options; you can choose from a 1 month subscription (25 euros) or a 7-day subscription (7 euros). Neither option is recurring, so you will have to make a new purchase once the previous one expires. You'll get an email notice when the subscription is about to expire. The subscription allows you to download data updates for The Handicapper. ​How long does it take for the subscription to be activated? The subscription is immediately activated and you can download the data package right away. ​Can the subscription be canceled? ​How often is the data updated? ​How are the predictions created? The Handicapper creates probabilities for different game outcomes purely based on data. As there doesn’t exist anything else than HISTORICAL data, the predictions are created with the hypothesis that historical events can explain future outcomes. The models within The Handicapper are tested on a regular basis and updated if something changes in the dynamics of the underlying market (rules, equipment etc.) or the explanatory power of some factor diminishes. You can think of the models for each sport (league) as multi-factor models, where the weights for each feature can be determined by the user. Each feature, which can be chosen by the user, should have at least some correlation with game outcomes. Even if I am a firm believer in a quantitative approach, practice has shown, that relying purely on quantitative models might not be an optimal path to success. A good model can be superior in many aspects, but things can also go very wrong when blindly following it. That's why my recommendation is to use the predictions The Handicapper creates as just one of several inputs to your decision to place (or not place) a bet. The software runs in Windows and requires Microsoft .NET Framework 4.6.1 (or newer version) to be installed, which is usually the case with newer versions of Windows. If you have issues with launching the program try installing Microsoft .NET Framework 4.6.1. (B) if you have bought access to data subscriptions from the Web Store you install the data package by clicking on the refresh icon (1), fill-in your credentials when the software asks for them and after that click on the download icon (2) that appears. Once the data package is downloaded the software is launched by pressing the 'Proceed' -button (3). A data update with game and player stats from the most recent match-day is usually ready 12-24 hours after the last match has finished. ​If you have bought access to data subscriptions from the Web Store you install the data package by following the same procedure as described above (B). All program files, which are included in the data package that can be downloaded/updated on a daily basis, are located in the 'The Handicapper'\data -folder. 'The Handicapper' is the folder the .exe-file (th6.exe) is located in. The data consists of text-files, which holds all the information that The Handicapper needs to run. User data files are files that are custom to the user, or can be customized, and are created at run-time. These files are located in \user -folder. ​From time to time there will be software updates. These are installed by replacing the th6.exe -file with the new one (which is also named th6.exe). Nothing else needs to be done for the update to take place. Schedule This is the main view of The Handicapper where you can view the daily scehdule and projections for MLB, NBA or NHL matchups. Settings Choose and customize settings for calculation of game probabilities (projections). Reports Run different reports with information on your bets and other important features. Twitter Link to my Twitter-account. ​Change between European- (EUR) or American- (US) odds type. If published, lineups for all active matchups for MLB and NBA at current date will be downloaded from online data providers. For MLB games weather information (temperature, wind strength and direction) is also downloaded if available. Open the calendar and select the date for which you wan't to view the schedule. Create projections for selected matchup(s). 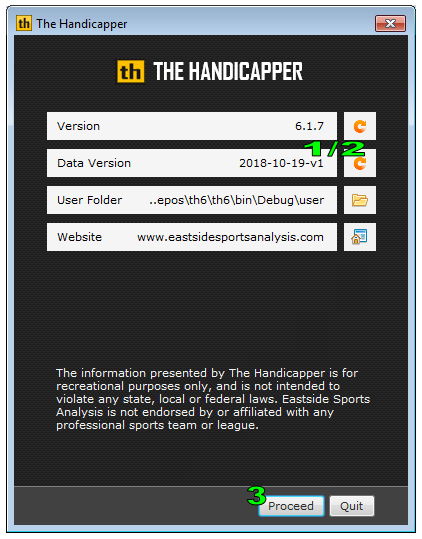 The projections are dependent on the user-defined handicapping settings and they are calculated only using information (data) that was available at the game date. Select which sport to view. DEF (default) - The lineup is based on current rosters and depth charts. PREV (previous game) - The same lineup as in the previous game. For MLB matchups it's the same lineup as in the previous game with a same handed starting pitcher as the current opponent. CONF (confirmed) - The lineup is either from an already finished game or confirmed (usually a few hours before the game starts). PROB (probable) - Probable starting pitcher (MLB). CUST (custom) - The lineup is customized by the user. The offense/defense total rating for each team. Team ratings are weighted averages of the selected lineups. Each player gets a projected playing time (or projected innings pitched, projected plate appearences etc.) which is used for the calculation. 100 is league average, which means that a team with a number above 100 has a better and a team with a number below 100 has at worse rating than league average. The ratings are dependent on the user-defined handicapping settings. This is the most important information where all data and calculations are compressed to a single number. The projections are dependent on the user-defined handicapping settings and they are calculated only using information (data) that was available at the game date. The red area shows the projection information for the Away Team and Over (Totals) and the blue area for the Home Team and Under (Totals). The probability that the away team will win the game is 22% with corresponding fair odds of 4,537 (European odds type). The probability that the home team will win the game is 78% with corresponding fair odds of 1,283 (European odds type). The probability that the away team will win the game when they are given a +9 points advantage is 51% with corresponding fair odds of 1,964 (European odds type). The probability that the home team will win the game when they are given deducted a -9 points advantage is 49% with corresponding fair odds of 2,038 (European odds type). The probability that there will be more than 213,5 points in the game is 49% with corresponding fair odds of 2,025 (European odds type). The probability that there will be less than 213,5 points in the game is 51% with corresponding fair odds of 1,976 (European odds type). ​The lowest odds a bet should be placed with. Obtained by dividing 1 with the probability. Projection confidence is roughly an estimate of available stats for all players. There is a certain threshold that gives 100% for a player. In the example above the 86 means that the total threshold for all players is 86% full. What this means, is that on average a player in this matchup has played enough games (or has enough minutes played, innings pitched, plate appearences etc.) that 86% of his threshold is filled. The threshold (to obtain 100%) for a starting pitcher (MLB) is for example 500 innings pitched during last three seasons + the ongoing season. Click to open a matchup analysis report with more detailed information about the matchup and projections. Click to open the Place Bet-panel (11). Select which bet type you wan't to bet on and scroll between different lines to obtain the projection for the selected one. By clicking on the 'Place Bet'- button the selection is stored in a file named 'betHistory.txt', which can be found in the \user -folder, and is read as input for the Bet History- report. Lineups can be modified by pressing the short name for the team in the 'Lineups'-column (starting pitcher name for MLB starting pitchers) and then selecting the player to change. A panel for selecting a replacement player is shown. The user can choose the replacement player from the current roster for the team (injured players should be excluded) or from all players in the database. The adjustable settings is the core feature of The Handicapper. By configuring the settings to match your believes of whats important and what's not (which stats and ratings to use etc. ), you can turn your believes into a number (probability). By configuring the settings you can give more/less impact to stats or ratings you believe should have a high/low impact on projecting the game outcome. You can set the default run/point/goal environment (average runs/points/goals per game) and adjust league average home team advantage. The exponential smoothing factor is a used to adjust the impact of trends in player performance. The higher the factor the more importance recent data is given in calculating player ratings. Even with the max factor (100) the most recent data point is not given a "too high importance" (to keep things statistically significant). Moving average is also a tool to adjust the importance of trends in player performance. The shorter the period the faster trends impact player value. Use default player projections as part of the total player projection. Use weather information as an input for the projections. Weather information has an impact on the run environment. Reset to default (back-tested) settings.